- fixes an issue when some spawn markers are not being deleted when you leave the area thus spawning items and NPCs again when you return to the same place - from now on all spawn markers are immediately deleting themselves after the spawning effect and v1.02 also changes the FormID of the markers so previously spawned markers from earlier versions should be all gone. 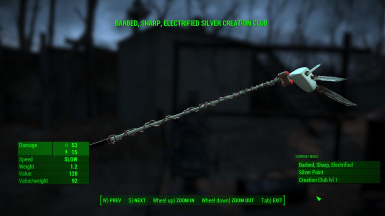 - adds a console command which you should only use at Abernathy Farm if for some reason the weapon hasn't been spawned for the first time: cgf "ccgolfclub_init.respawngolfclub"
This mod is based on a pun. A wordplay. I've never said anything about the actual Creation Club or Bethesda - neither in my video nor in my mod description, and that was intentional. The mod does nothing that would cost money for the player or take money away from the player as a lot of commenters suggested. That was intentional as well. 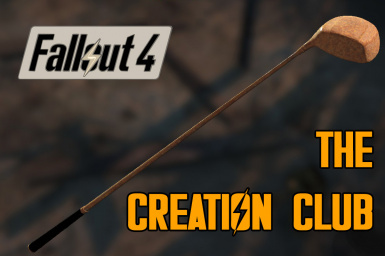 The mod is not meant to make fun of Bethesda's Creation Club. It's just a simple joke, and I was having the impression that it's not at all offensive to anyone. At least my intention was never to offend Bethesda or anyone on the Nexus. Please do not praise, endorse or vote for this mod if you see it as a statement against anything you disagree with! Support this mod only if I just made you giggle with a lighthearted joke. 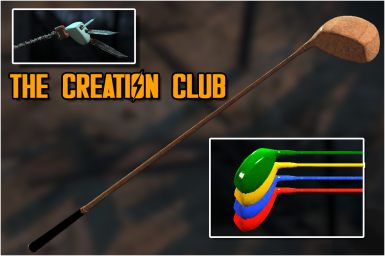 A golf club melee weapon that randomly creates a vast variety of items, creatures or characters around the player while swinging it. Comes with weapon upgrades and color variants. Removing the extra ability turns the weapon into a regular golf club. THIS MOD REQUIRES AN EASY UNINSTALL STEP! MAKE SURE YOU READ MY "HOW TO UNINSTALL" INSTRUCTIONS AS WELL! To install the mod use a mod manager like Nexus Mod Manager. 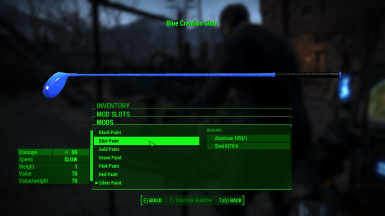 Extract the contents of the rar file to your Fallout 4 Data folder and enable CCGolfClub.esp using a mod manager or manually. Place the weapon back to Mary's grave where you found it and follow the instructions. You'll find the Creation Club behind Abernathy Farm at Mary's grave. The item is placed at the location with a script so you shouldn't worry about conflicting cell edits. - Barbed, Sharp and Electrified with the usual benefits of these upgrades. You can choose any combination of these three. The mod uses its own dynamic instance naming rules so sorting mods might not be fully compatible with this one particular weapon. Otherwise should be compatible with everything. The item is placed at the specified location with a script so you shouldn't worry about conflicting cell edits. If for some reason the weapon lost its ability to spawn objects just reequip it and it should work fine.